1. The Central Excise Act, 1944 or Finance Act, 1994 is proposed to be amended so that a reference in said Act to a Chief Commissioner of Central Excise or a Commissioner of Central Excise may also include a reference to the Principal Chief Commissioner of Central Excise or the Principal Commissioner of Central Excise, as the case may be. Further, definition of Central Excise Officer has been broadened so as to include Principal Chief Commissioner of Central Excise and Principal Commissioner of Central Excise. 2. New section 15A to be inserted so as to empower the Central Government to prescribe an authority or agency to whom the information return shall be filed by the specified persons such as Income-tax authorities, State Electricity Boards, VAT or Sales Tax authorities, Registrar of Companies. Information can be collected for the purposes of the Act, such as, to identify tax evaders or recover confirmed dues. A new section 15B also proposed to be inserted to provide for imposition of penalty on failure to furnish information return. 3. Section 32E(1) proposed to be amended so as to allow filing of applications of settlement before the Settlement Commission in cases where the applicant has not filed the returns after recording reasons for the same. 4. Section 35L proposed to be amended so as to clarify that determination of disputes relating to taxability or excisability of goods is covered under the term ‘determination of any question having a relation to rate of duty’ and hence, appeal against Tribunal orders in such matters would lie before the Supreme Court. 1. The Customs Act, 1962 proposed to be amended so that a reference in said Act to a Chief Commissioner of Customs or a Commissioner of Customs may also include a reference to the Principal Chief Commissioner of Customs or the Principal Commissioner of Customs, as the case may be. Further, Principal Chief Commissioner of Customs and Principal Commissioner of Customs also proposed to be included in the class of officers of customs. 2. Section 15(1) proposed to be amended to provide for determination of rate of duty and tariff valuation for imports through a vehicle in cases where the Bill of Entry is filed prior to the filing of Import Report. 3. Section 46(3) proposed to be amended to allow the filing of a Bill of Entry prior to the filing of Import Report for imports through land route. 4. Section 127B(1) proposed to be amended to provide that an application for settlement of cases can also be filed in cases where a Bill of Export, Baggage Declaration, Label or Declaration accompanying the goods effected through Post or Courier have been filed. Section 8B of the Customs Tariff Act, 1975 proposed to be amended so as to provide for levy of safeguard duty on inputs/raw materials imported by an EOU and cleared into DTA as such or are used in the manufacture of final products & cleared into DTA. (i) raise the free baggage allowance from Rs. 35,000 to Rs. 45,000. (ii) reduce the duty free allowance of cigarettes from 200 to 100, of cigars from 50 to 25 and of tobacco from 250 gm to 125 gm. Section 32O(1) of the Central Excise Act, 1944/Section 127L of the Customs Act, 1962 proposed to be amended to clarify that reference to the concealment of particulars of duty liability is any such concealment made from the officer of central excise/customs and not from the Settlement Commission. Section 35B(1) of the Central Excise Act, 1944/Section 129A(1) of the Customs Act, 1962 proposed to be amended so as to increase the discretionary powers of the Tribunal to refuse admission of appeal from the existing `50,000 to `2 lakh. Section 35B(1B) of the Central Excise Act, 1944/Section 129A(1B) of the Customs Act, 1962 proposed to be amended so as to enable the Board to constitute a Review Committee by issuing an order instead of a notification to be published in the Official Gazette. Proviso to section 35E(3) of the Central Excise Act, 1944/Proviso to section 129D(3) of the Customs Act, 1962 proposed to be inserted to vest the Board with powers to condone delay for a period upto 30 days for review by the Committee of Chief Commissioners of the orders in original passed by the Commissioner. Section 35F of the Central Excise Act, 1944/Section 129E of the Customs Act, 1962 proposed to be substituted with a new section to prescribe a mandatory fixed pre-deposit of 7.5% of the duty demanded or penalty imposed or both for filing appeal with the Commissioner (Appeals) or the Tribunal at the first stage and 10% of the duty demanded or penalty imposed or both for filing second stage appeal before the Tribunal. The amount of pre-deposit payable would be subject to a ceiling of `10 crores. Further, provisions relating to grant of stay by the Tribunal proposed to be omitted in section 35C(2A) of the Central Excise Act, 1944/section 129B(2A) of the Customs Act, 1962. Section 35R of the Central Excise Act, 1944/Section 131BA of the Customs Act, 1962 proposed to be amended so as to enable the Commissioner (Appeal) to take into consideration the fact that a particular order being cited as a precedent decision on the issue has not been appealed against for reasons of low amount. 1. Hitherto, sale of space or time for advertisements in broadcast media, namely radio or television was only liable to service tax. However, now sale of space or time for advertisements on other segments like online and mobile advertising is proposed to be brought under the service tax purview. Sale of space or time for advertisements on print media is included in negative list and thus, not taxable. Now, print media is also being defined to exclude business directories, yellow pages and trade catalogues which are primarily meant for commercial purposes. 2. Services of transportation of passengers by radio taxis/radio cabs to be brought under the service tax net to bring them at par with rent a cab service. Therefore, definition of metered cabs under section 65B(32) to be amended to specifically exclude radio taxis/radio cabs as also services provided by radio taxis/radio cabs proposed to be excluded from entry (o) of the negative list. Further, abatement of 60% of the gross amount available to rent-a-cab service also to be made available to radio taxi service. 3. In Section 67A, for determination of rate of exchange, rules would be prescribed for calculation of taxable value in respect of certain services. (Rules would be prescribed in due course after the Finance Bill receives the assent). 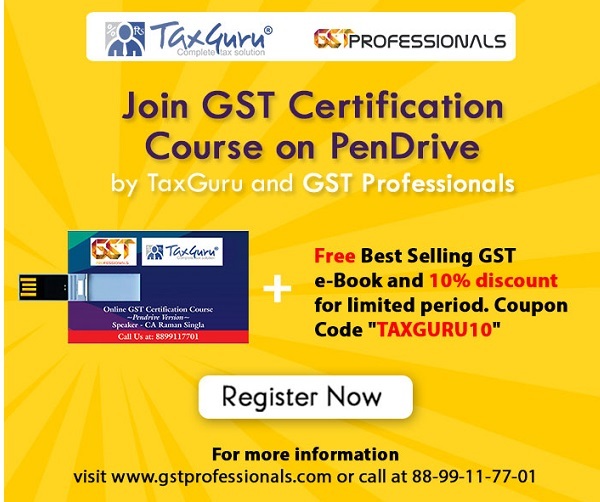 Following amendments are applicable with effect from 11.07.2014 unless otherwise specified. (a) Exemption to services by way of technical testing or analysis of newly developed drugs on human participants by a clinical research organisation approved to conduct clinical by the Drug Controller General of India withdrawn. (b) Exemption to transport of passengers by an air conditioned contract carriage withdrawn. (a) Exemption to services provided by operators of the Common Bio-medical Waste Treatment Facility to a clinical establishment by way of treatment or disposal of bio-medical waste or the processes incidental thereto. (b) Exemption to services provided by way of transportation by rail/vessel/GTA of organic manure and cotton, ginned or baled. (c) Exemption to life insurance service provided by life micro-insurance product as approved by the IRDA, having maximum amount of cover of Rs. 50,000. (d) Exemption to services by way of loading, unloading, packing, storage or warehousing of rice, cotton, ginned or baled. (e) Exemption to services received by the Reserve Bank of India, from outside India in relation to management of foreign exchange reserves. (f) Exemption to services provided by a tour operator to a foreign tourist in relation to a tour conducted wholly outside India. (a) Exemption to services provided to an educational institution by way of auxiliary education services and renting of immovable property services has been rationalised. (iii) security or cleaning or house-keeping services in such educational institutions; and (iv) services relating to admission to such institution or conduct of examination. In view of this rationalization, exemption extended so far in respect of renting of immovable property service received by educational institutions, stands withdrawn. (b) Exemption available to accommodation services provided by hotels, dharamshalas or ashrams when they provide rooms for less than Rs. 1,000 per day, re-worded to bring out the intent clearly. (c) For greater clarity, the exemption in respect of services provided to Government or local authority or governmental authority made more specific. Services by way of water supply, public health, sanitation conservancy, solid waste management or slum improvement and up-gradation continue to remain exempted but exemption not be extendable to other services such as consultancy, designing, etc., not directly connected with these specified services. The condition for availing abatement in case of GTA service is being amended with immediate effect to clarify that the condition for non- availment of credit is required to be satisfied by the service providers only. The taxable portion of service of transportation of passenger by air-conditioned contract carriages shall be 40% with the condition that CENVAT credit of inputs or capital goods or input services has not been taken. With effect from 01.10.2014, CENVAT credit of input service of renting of a motor cab is allowed if such services are received from a person engaged in the similar line of business i.e. a sub-contractor providing services of renting of motor cab to the main contractor. The whole of the CENVAT credit has been allowed with respect to input service of renting of any motor cab, received from a person who is paying service tax on 40% of the value of services. The CENVAT credit eligibility will be restricted to 40% of the credit of the input service of renting of any motor cab if service tax is paid or payable on full value of the services i.e. no abatement is availed. With effect from 01.10.2014, tour operator service providers, availing abatement, are allowed CENVAT credit on the input service of another tour operator, which are used for providing the taxable service. With effect from 01.10.2014, abatement in respect of transport of goods by vessel is increased from 40% to 50%. (a) Services provided by a recovery agent to a banking company/financial institution/NBFC. (b) Services provided by a Director to a body corporate. With effect from 01.10.2014, in renting of motor vehicle, where the service provider does not take abatement, the portion of service tax payable by the service provider and service receiver will be 50% each. With effect from 01.10.2014, e-payment of service tax is made mandatory. Relaxation from e-payment may be allowed by the Deputy/Assistant Commissioner on case to case basis. “Resident private limited company” has been notified as class of persons under section 96A(b)(iii) of the Finance Act, 1994 who can make application for advance ruling. 1) Central Excise Officer would issue authorization in Form A-2, within fifteen working days from the date of receipt of Form A-1 by the Central Excise Officer. 2) Authorization will have validity from the date on which Form A-1 is verified by the Specified Officer of SEZ. However, if Form A-1 is furnished after a period of 15 days from the date of its verification by the Specified Officer, the authorization shall have validity from the date of furnishing of Form A-1 to the Central Excise Officer. 3) SEZ Units or the Developer will, pending issuance of Form A-2, be entitled to avail upfront exemption on the basis of Form A-1. However, in such a case, the SEZ Unit/Developer would be required to furnish a copy of authorization issued by the Central Excise Officer within 3 months from the date of receipt of specified services. If a copy of authorization is not provided within the said period of three months, the service provider shall pay service tax on the service so provided availing the exemption. 4) As regards services covered under full reverse charge, it is being mentioned specifically in Form that there would be no requirement of furnishing service tax registration number of service provider. 5) It is being provided that a service shall be treated as exclusively used for SEZ operations if the recipient of service is SEZ unit or developer, invoice is in the name of such unit/developer and the service is used exclusively for furtherance of authorized operations in SEZ. With effect from 01.10.2014, in rule 2A of the Service Tax (Determination of Value) Rules, 2006, category ‘B’ and ‘C’ of works contracts to be merged into one single category, with service portion as 70%. Note: As specified in the proviso to section 75, three per cent concession on the applicable rate of interest will continue to beavailable to the small service providers i.e. assessee having theturnover nor exceeding Rs. 60 lakhs during the preceding F/Yor during any of the financial years covered by the notice. E-payment of service tax which was presently subject to monetary limit of Rs. 1 lakhs is being made mandatory for every assessee. Relaxation from e-payment may be allowed by the Deputy Commissioner/Asst. Commissioner on case to case basis. Rule 4: Place of provision of performance based services – Provision for prescribing conditions for determination of place of provision of repair service carried out on temporarily imported goods is being omitted. The second proviso to rule 4(a) is being amended to prescribe that it would suffice for the purpose of exclusion of repair service from applicability of rule 4(a) that the goods imported for repair are exported after repair without being put to any use other than that which is required for such repair. It may please be noted that this exclusion does not apply to goods that arrive in the taxable territory in the usual course of business and are subject to repair while such goods remain in the taxable territory, e.g., any repair provided in the taxable territory to containers arriving in India in the course of international trade in goods will be governed by rule 4. (c) Intermediary Service The definition of intermediary is being amended to include the intermediary of goods in its scope. Accordingly, with effect from 1.10.2014, an intermediary of goods, such as a commission agent or consignment agent shall be covered under rule 9(c) of the Place of Supply of Services Rules. (d) Service consisting of hiring of means of transport, upto a period of one month Service consisting of hiring of Vessels (excluding yachts) and Aircraft is being excluded from rule 9(d). Accordingly, hiring of vessels, or aircraft, irrespective of whether short term or long term, will be covered by the general rule, that is, the place of location of the service receiver. Hiring of yachts would however continue to be covered by rule 9 (d). As per the first proviso to Rule 7 of POT Rules, 2011, for reverse charge services, if payment is not made within a period of 6 months of the date of invoice, POT will be governed by Default Rule 3 of POT Rules, 2011. However, first Proviso to rule 7 of the Point of Taxation Rules (POTR) is being amended to provide that point of taxation in respect of reverse charge will be the payment date or the first day that occurs immediately after a period of three months from the date of invoice, whichever is earlier. This amendment will apply only to invoices issued after 1st October, 2014. A transition rule is being prescribed (new rule 10 of POTR). Section 5A(2A): It prescribes that insertion of Explanation in any Notification/ Orders within one year of issue of such Notification shall have effect as if it had always been part of the first such notification/ order. Section 15A: This section is being inserted in Central Excise Act to prescribe that specified third party sources shall furnish periodic information in the manner as may be prescribed. Section 15B: This section is being inserted in Central Excise Act to provide to penal consequences in the event of failure to provide information under Section 15A. *subject to a ceiling of Rs. 10 crores. It is pertinent to mention that all pending appeals/ stay application would be governed by the statutory provisions prevailing at the time of filing such Stay Applications/ Appeals. 3. Section 80 which provides for non-imposition of penalties in case there is a reasonable cause for failure is being amended to exclude the reference of first proviso to sub section (1) of section 78. This amendment, in effect, removes the power to waive the 50% penalty imposable in cases where service tax has not been levied, not paid or short levied or short paid on account of suppression of facts or willful misstatement but true and complete details of transactions are available in the specified record. Consequently, in such a case levy of 50% penalty would be mandatory even if the assessee proves that there was a reasonable cause of such failure. 4. Section 82(1) is being amended, along the lines of section 12F (1) of the Central Excise Act, so that Joint Commissioner or Additional Commissioner or any other officer notified by the Board can authorize any Central Excise Officer to search and seize. 5. Sub-section (6A) of section 86 which specifies a fee of Rs. 500/- in case application is filed to Appellate Tribunal for grant of stay or for rectification of mistake or for any other purpose or for restoration of appeal is being amended to omit the words “for grant of stay or”. 6. Section 87 is being amended to incorporate power to recover dues of a predecessor from the assets of a successor purchased from the predecessor as it is presently provided for in section 11 of the Central Excise Act, 1944. (c) to issue instructions in supplemental or incidental matters. A manufacturer or a service provider shall take credit on inputs and input services within a period of six months from the date of issue of invoice, bill or challan. Currently, CENVAT Credit can be claimed at any time after receipt of invoice. The budget amendments are W.E.F??? Excellent Compilation and useful presentation. Thanks and all the best. Thanks a lot. Budget 2014-15 excellent presentation. Thanks and very useful article presentation budget 2014-15. Can’t stop me to read. really very nice presentation with old proviso comparision. A good presentation covering all the issues. whether a Compnay is liable to pay Service Tax for vehicle hired for transporting Staff from Residence to Office(Work place). Thanks a lot. wonderful and useful presentation. As regards SSI exemption limit of clearances upto 1.5 crores till now, has the limit been increased in this budget?